“Go,” he told him, “wash in the Pool of Siloam.” (This word means Sent). The ninth chapter of John tells the story of a healing and its aftermath. Jesus is traveling with his disciples when they come upon a man who has been blind from birth. The disciples inquire whether there is some past sin behind this blindness. Jesus denies it and then shows forth the work of God by spitting on the ground, making some mud, and putting it on the man’s eyes. He tells him to go and wash in the pool of Siloam and then he will be clean. Jesus’ words come true. Afterward, everyone in the neighborhood is astounded. They hardly recognize him. Once he tells his story, they (the ever present and mysterious ‘they’) bring the man before the Pharisees who proceed to question him about his healing, which took place on the Sabbath. He is interrogated, his parents are brought it, he repeats his story multiple times (once even asking if the Pharisees want to become Jesus’ disciples too) and he is finally thrown out for his loyalty to Jesus. Jesus then comes to the man on the road and reveals himself to him, prompting a sincere profession of faith from him. A powerful story of the power of God and the challenge of testimony. Yet, there was one odd detail that stuck out to me. I believe that the Holy Spirit doesn’t make mistakes. So even when there is a detail that seems confusing or unneccesary to me at first, I trust that God has placed it in the Bible for a reason. In John 9, this detail was Siloam. This is the only place named in the narrative. In fact, it is the only thing named in the narrative apart from Jesus. Additionally, the Apostle John, inspired by the Holy Spirit, seemed to think that we needed to know that the word ‘Siloam’ meant ‘sending.’ Why is this detail important? How does knowing that Siloam means Sent help us better understand what God is saying in this passage. The pool of cleansing is the pool of sending. The very pool that this man goes to in order to be cleansed, restored, and healed, is also a place of sending. It’s very name means sent. He goes to Siloam to be clean, to see, and finds himself sent out to testify to the grace and healing he has received from Jesus. Maybe this man isn’t the only one washed in the Pool of Siloam. Each and everyone one of us who has been baptized came to the waters as a sign and seal of God’s promise to cleanse us from sin, to refresh our souls, and to give us living water for eternal life. But what if this pool was also a pool of sending? What if we came to be clean and found ourselves sent? Maybe in our own baptisms we find ourselves sent to testify to the grace and healing we have received from Jesus. called to follow Christ in mission. Amen. 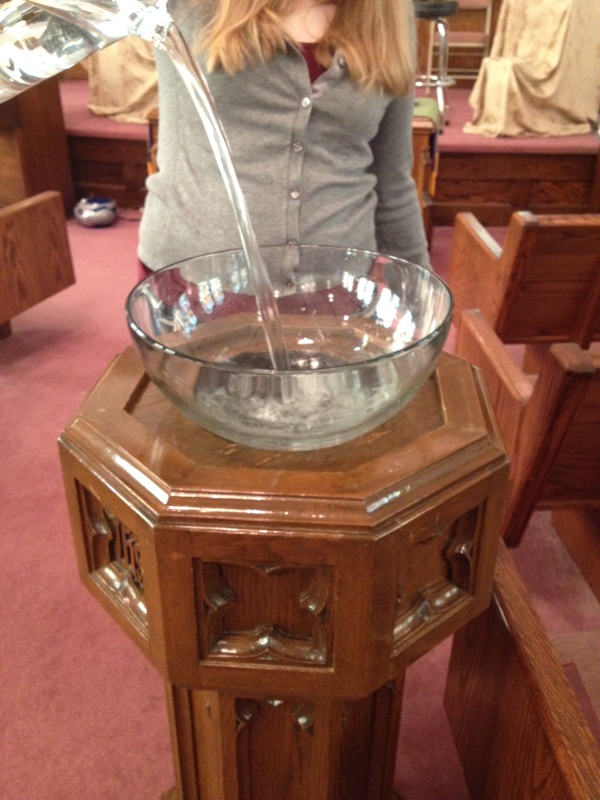 Maybe Siloam is there in this story to remind us of our own baptisms and the ever-present call to mission. Maybe Siloam is there to remind us that we too were washed in the Pool of Sending. Where might God be sending you in light of your baptism?